and 17th Century Churches of Goa, highlighting Indo-Portuguese Architecture will be inaugurated at Francis of Assisi Church, Old Goa on December 5, 2018 from 4pm, organised by Se Cathedral. Self-taught fine arts photographer Payal Kakkar spent two years photographing churches in Goa. Giving a new dimension to architecture in the genre of documentary, the highly detailed and quality images reveal the true essence of the designs. 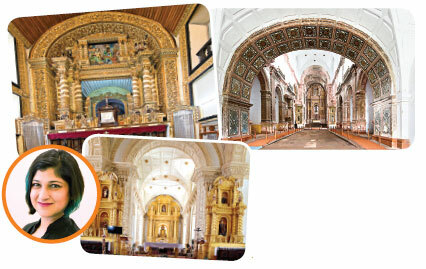 This unique collection of photographs of the 16th and 17th Century Churches of Goa is an opportunity to see Goan churches within a National Heritage Monument. Here, 32 images will be on display until December 14, 2018. Kakkar’s works evoke an emotional response to a form of architecture. It is where the image brings out more of the artist’s perception and mood, which is further shared with others thus making an impact. These images showcase her journey through a multi-dimensional world. “It is an attempt to convey a personal impression of not just what I saw but also of how I felt during the whole process of producing my works,” says Kakkar, who will also be speaking about her photo exhibition at the prestigious Goa Arts and Literature Festival (GALF) on December 7, 2018 at Abolim Hall, ICG from 2pm to 2:40pm. Having a background in Indian Classical dance, Environmental Protection and Dietics, Kakkar has focussed on the practice of photography for the last six years, having produced bodies of work in Italy and Cambodia. In her larger body of work, Kakkar is drawn to architectural spaces having a language and conversation of their own. Her photographs reveal the soul of the structures and the impact of the passage of time as they witness empires grow and fall. “My constant quest for understanding the culture and history of places made me read the works of Paulo Varela Gomes and Jose Pereira,” she says, about how she decided to take up this project that was not just time consuming, but utterly fulfilling. While being true to the built environment, Kakkar’s images also reveal an emotional landscape, a psychological dimension that is beyond the stone reality. She is able to enhance the true nature of structure, not only of how it looks but also how it feels to be in its presence. The exhibition will remain open for public viewing until December 14, 2018, from 9am to 5:30pm.